Ngai, Pun. Made in China: Women Factory Workers in a Global Workplace. Durham, NC: Duke UP, 2005. 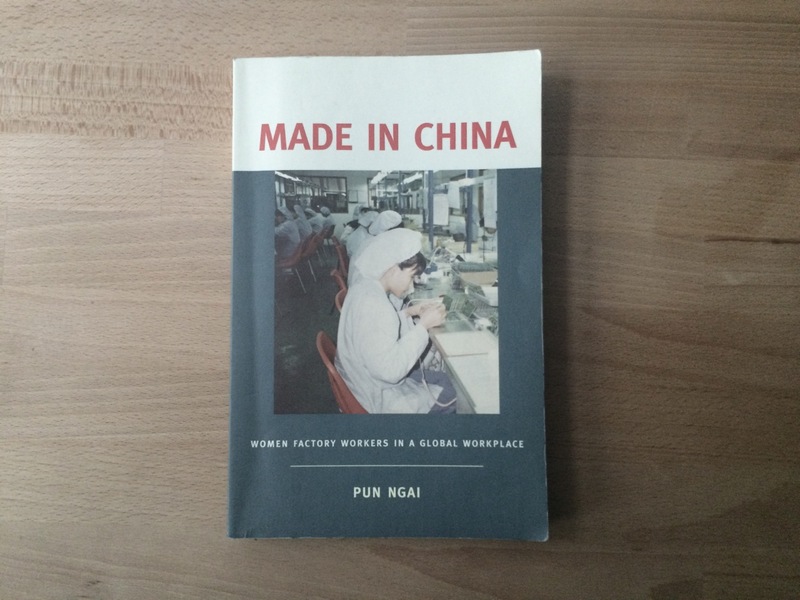 Made in China is the result of an ethnographic study carried out by the author, Pun Ngai, in 1994 – 1996 at an electronics factory in Shenzhen, China. Ngai’s main subject is the dagonmei (the working girls), young women mostly at the ages of 17 – 24, who temporarily move from rural parts of China to work at urban factories. Throughout the book, Ngai shares her first person observations on the tough factory lives of the dagonmei and explores a variety of physical, psychological, social, and political issues surrounding them. As China has evolved into a global factory in the last three decades, the dagonmei have formed a new cultural class. Their labor, however, is often short term, which usually lasts about four to five years. This temporality is not the choice of the women but mainly caused by the hukou registry system set by the state laws in China. The Hukou is a registry system that was set in 1958 to control migration, but ended up pre-defining the entire life chances of every citizen in China, simply based on whether this person was born in a rural or urban area. If a person was born to a family in a rural place, the system strictly tied this person to a permanent rural residence and did not allow this person to stay in the cities, establish families, and benefit from education or medical services in urban areas. In 1980s however, with the establishment of Shenzhen as a special economic zone, ‘temporary residence’ was introduced as a new form of being. Consequently, the dagonmei have gained the allowance to move to urban areas, albeit only for temporarily, without being granted an actual urban residence. The rules of the temporary residence permit have brought about the concept dormitory labour, in which, women factory workers live all together in a dorm close to the factory in highly deprived physical conditions. This results in the maximization of the work time and high exploitation of the women workers by the enterprises. This piece of text shows how the system of temporary workers is legitimized by the Chinese state. It clearly suggests that foreign and local enterprises do not have to worry about the reproduction of labor in the long run. The workers are dismissible, as they come and go. This allowance eventually leads the enterprises to focus on extracting maximum working power from the workers without caring about their well being and satisfaction at all. Throughout her text, Pun Ngai conveys a detailed portrayal of the working conditions of the dagonmei, and analyzes the disciplinary instruments that are used by the enterprises to shape those conditions towards maximizing monetary profit. One of the main techniques of power, according to Ngai, is the spatial organization of the factory, which strictly organizes the workers along functional and productive assembly lines and “nails [them] down into a grid of power and discipline.” The second instrument is the timetable, which simply shapes the everyday life practices of the women around a typically eleven to twelve hours working day. The timetable not only stratifies and regulates the working time of the dagonmei, but also leaves them with not enough time to establish any sort of private life of their own. Ngai presents the factory rules and regulations as the third power technique. The factory regulation handbook and framed lists of regulations that are hung everywhere in the factory are used to order the heterogeneous migrant workers into a standardized set of behavior. The fourth and final power technique that Ngai suggests is the electronic eye. Through cameras that are obscured but known as a fact to be placed somewhere and everywhere, the factory uses the principle of ‘panopticon’ to create the sense of being watched and control the workers’ behaviors. One interesting statement that Pun Ngai makes in the book concerns the answer to the question ‘why’ these women might be choosing this extremely challenging lifestyle. The general view to the subject is that the women do this only for money. The most typical argument is that the women briefly leave the patriarchal structure of rural Chinese families to gain some income before they return to their villages to get married as they are supposed to. In those views, Chinese rural women are often pictured as submissive and repressed. Ngai’s argument, however, brings about other reasons for these women to come into the factory than gaining the necessary income. Pun Ngai argues that the women clearly know what they are going into as they leave their villages. They are willingly choosing to leave their patriarchal families for this temporary lifestyle to explore free and individual life, as almost a form of resistance. Quoted in: Ngai, P., Made in China, p. 47. Ngai, P., Made in China, p. 80.